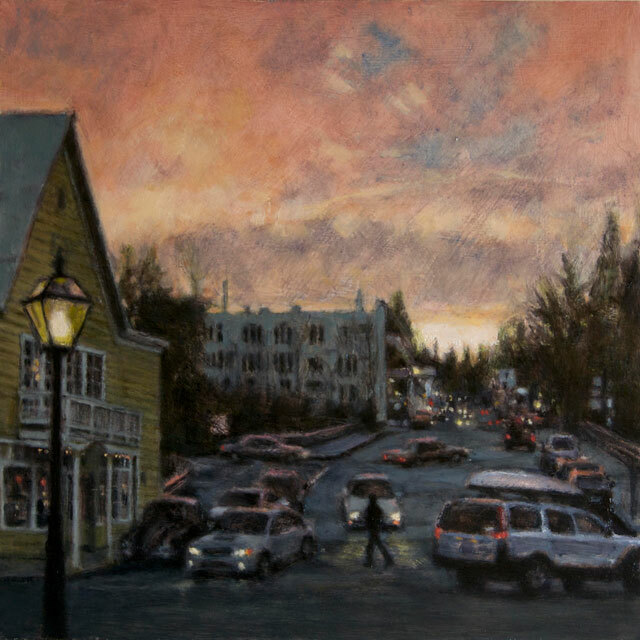 Nevada City is a painter’s paradise – with historic architecture, natural beauty, four seasons, and wonderful light from dawn to dusk. Nevada City’s entire downtown historic district is listed on the National Register of Historic Places and looks much the same as it did in the 19th century. The wood, tin and brick buildings are rich in architectural detail – with wood and iron shutters, Victorian turrets, iron railings, and stained glass. Authentic gas lamps light the streets and mining equipment from the Gold Rush – monitors, Pelton wheels and stampers – can be found in the parks and plazas throughout the town. 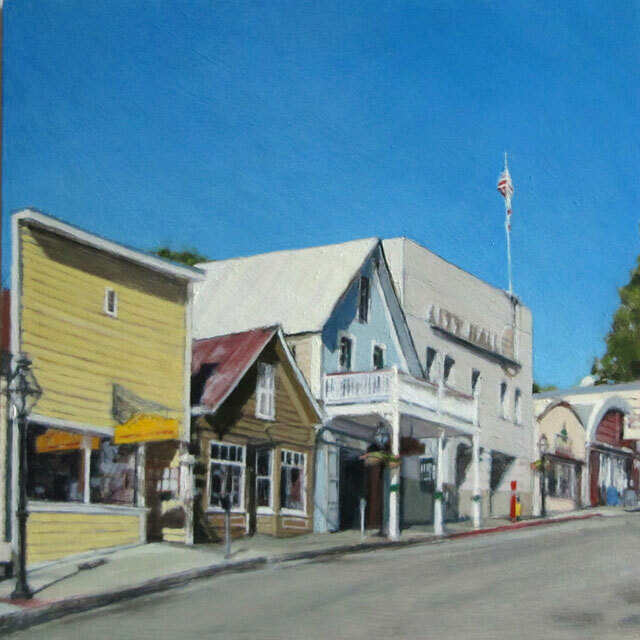 There are grand Victorian houses and tiny miners’ cabins, the National Hotel, the Nevada Theatre and several beautiful churches in a setting of unparalleled natural beauty – everywhere you look is a painting just waiting to be painted. Natural beauty also abounds, both in town and nearby – with Deer Creek, the Yuba River, Scotts Flat Lake, Malakoff Diggins and numerous vineyards and farms. Deer Creek rolls through town and the Yuba River can be accessed at a number of locations including the South Yuba River at Bridgeport, Edwards Crossing, Purdon Crossing and the 49er Bridge. Serene Scotts Flat Lake, surrounded by majestic pine, fir and cedar trees and with snow-capped mountains in the distance makes a wonderful subject all year round – as does Malakoff Diggins, a “mini Grand Canyon” created by hydraulic mining. There are many vineyards and farms throughout the area, and all summer long our local farmers’ markets also make wonderful painting subjects. The nearby town of Grass Valley also boasts wonderful architecture – from the Gold Rush era Holbrooke Hotel to the Art Deco Del Oro Theatre. Grass Valley is also home to the Empire Mine – the most profitable hard rock gold mine in California. The Empire Mine is now a state park, with beautiful gardens and grounds and the picturesque Bourn Cottage. We are blessed with four seasons, and the fall in Nevada City is a riot of color – often referred to as the “New England of the West”. The trees turn rich shades of red and orange and are particularly striking along Nevada Street. In the winter, the town is especially beautiful with a light dusting of snow, and in the spring, nothing compares to the cherry tree in full bloom at Ike’s Quarter Café. All summer long, the sky is a rich cloudless blue, with the sun casting amazing shadows of lampposts and other Victoriana. 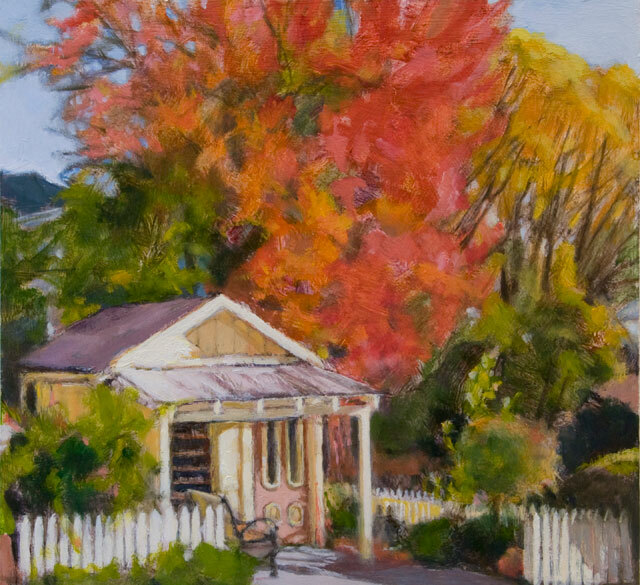 If you enjoy looking at art, visit us the first two weekends in October for the Fall Colors Open Studio Tour – when visitors are invited into artists’ studios throughout Western Nevada County. 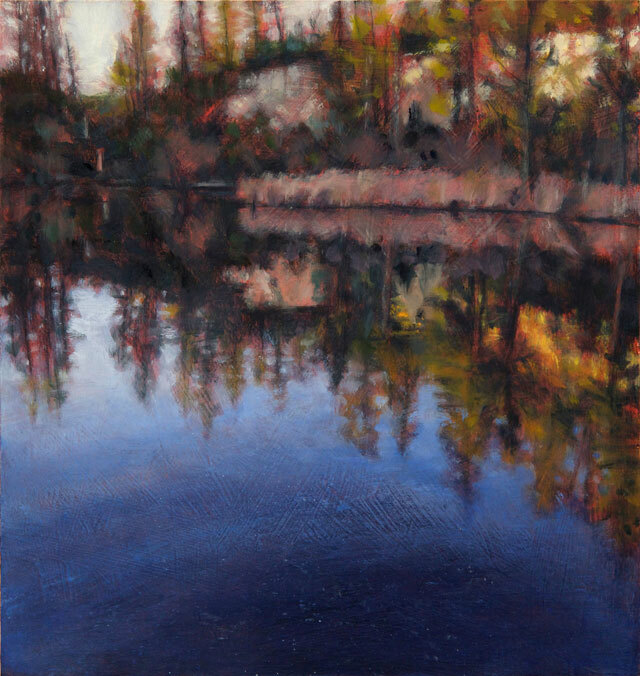 Art can be enjoyed all year round in our local art galleries: Mowen Solinsky and Lilly Vigil in Nevada City; and Art Discovered, Artworks and ASiF Studios in Grass Valley. 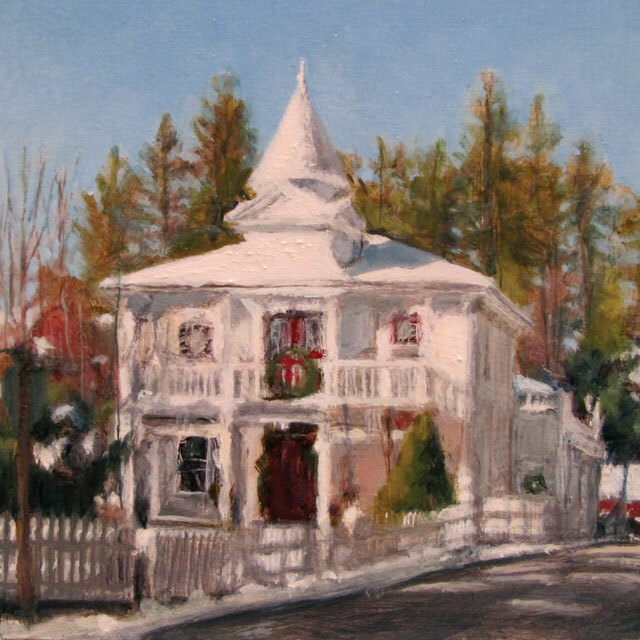 Local artists also display their work at cafes, coffee shops and wine tasting rooms throughout both towns. 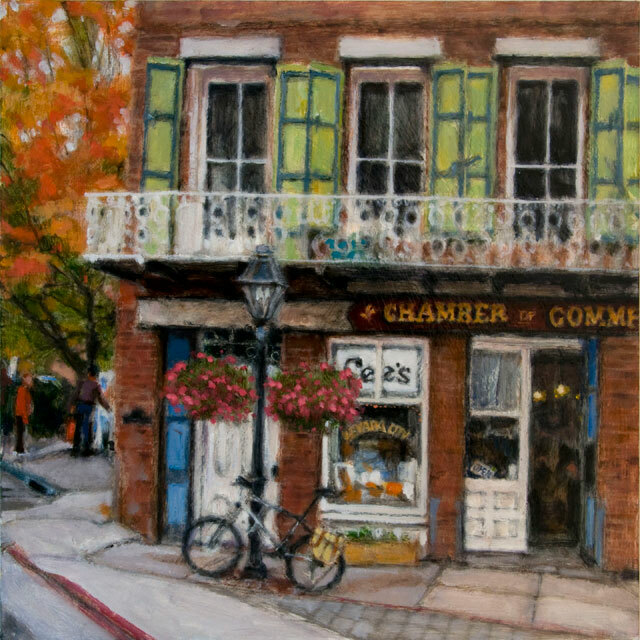 Whether you are here to paint, or just to enjoy and buy art, you will be amazed by the wealth of subject material and talent in Nevada City! 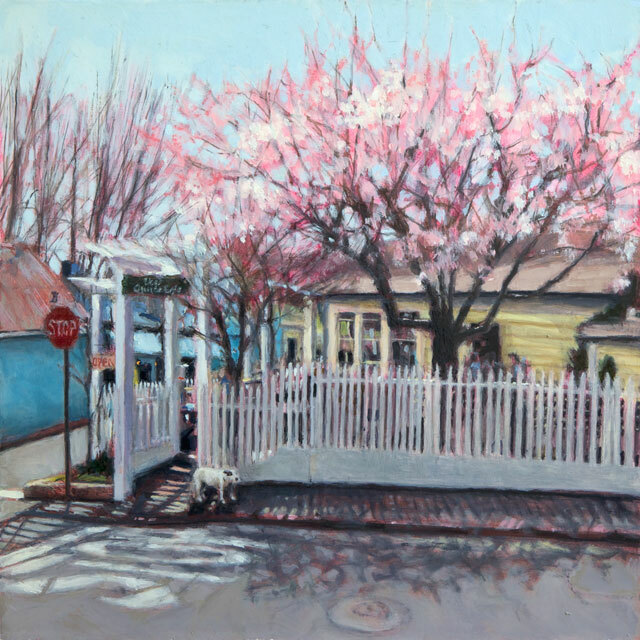 Painting in Nevada City satisfies local artist Roseanne Burke’s passions for history, architecture, nature and the four seasons and she can often be seen around town painting en plein air. She also enjoys traveling to paint other beautiful places around the world. 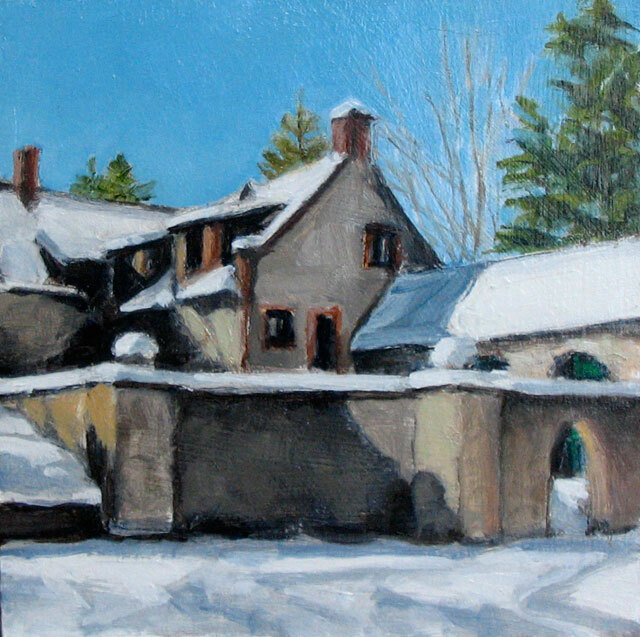 You can find cards with her images at J.J. Jackson’s in Nevada City, or view her paintings on-line at www.roseanneburke.com.